The path of many timeless artists follows a similar path. Their craft is unappreciated in their time, they create a true masterpiece, and many years later they are considered to be legends. For Balt Getty and KO the Legend, collectively known as The Wow, they aren’t willing to walk that path. That’s why after hitting us with “Talk My S**t,” and following up with the aptly titled “Masterpiece,” they are now dropping “LGNDRY.” This dynamic jam is true to its name and solidifies The Wow as a group that is not just in it for the long term but also making their mark here and now. 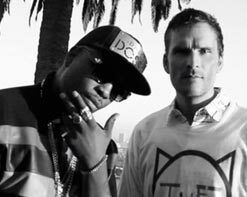 Much of the inspiration for the sound of The Wow, along with other Balthazar Getty projects such as Abstrakto and SOLARDRIVE, comes from his home studio. And it’s not just any studio, but the former home of the legendary Rick Rubin. What now houses the Purplehaus roster and studio was also the very rooms that captured many of Rubin’s classics, most notably the American series by the late Johnny Cash. To say that this studio has powerful vibes would be crass understatement! And while previous videos from Purplehaus have given a glimpse here and there of the studio, it’s “LGNDRY” that really showcases the beauty and inspiration that this room holds. On paper it may not sound like a particularly complex video and it’s been done before. But when you combine Balt’s strong sense of cinema and he and KO’s unparalleled chemistry in the booth and behind the console you get a clip that shows just how fierce and dynamic this duo can be. The studio naturally lends itself to the camera with classical European architecture and spacious rooms that each carry their own history identity. Of course, the real stars here are The Wow, and we are privy to an unfiltered look at their unique creative process. With all the right pieces in place, they blaze through “LGNDRY” with reckless abandon and once we all come out the other end we will all certainly need a minute to catch our breath! Once again we are thrilled to be working with the Purplehaus crew to bring you another stellar video from The Wow. Hit us up for a copy of their new EP, LGNDRY, or anything else you may need to get this video into your programming. Please contact Andy Gesner at (732)-613-1779, email us at info@HIPVideoPromo.com.